Claire's and Icing are those stores that I have easy access to, but I do not shop at often. I know when I go in there 8 out of 10 times I'll find something new and cool I want. Haha, that's why I try to avoid it. The temptation is strong! Lately, they both have an excellent selection of fun glitter polishes. The best part of Claire's and Icing is they have this permanent Buy One Get 1 50% off sale on their cosmetics. Their polishes usually are $4-$5 a pop, so this makes them really affordable and even more tempting. I picked up this pretty I spotted last weekend. I couldn't resist it! Pinata is a mixture of gold, silver, purple, red, blue, and green shredded glitters in a clear base. Seriously how could I not resist this? It is amazing! 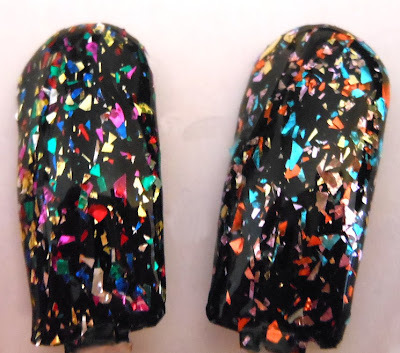 I do not have a rainbow shredded glitter polish like this, so I was very excited to see this. I did add some thinner to this off the bat, as I did find it a bit on the thick side. The thinner did the trick though, and I found it easy to apply afterwards. I love the bright colors in this polish, and I'm really very excited about it. I'm so excited about this one, I'd call it a must have especially if you do not have any polishes like this one. After typing up this review, I knew I'd get some questions on how this compares to Cult Nails Happy Ending. The pic below is a comparison on nail wheels. L-R Claire's Pinata & Cult Nails Happy Ending. They both are shredded glitters, but their color scheme is entirely different. Happy Ending is a mix of orange, gold, aqua, and lavender glitters, while Pinata is a mix of gold, silver, purple, red, blue, and green glitters. I *think* I found this one on the Claire's website if you do not have a Claire's near you. This is the listing, it isn't called Pinata though, just "Multi". While, the image is of the correct polish I am not 100% sure that is what you're getting since it is named different. If you're interested in purchasing this online, I'd contact Claire's customer service first, and verify that is the correct polish. 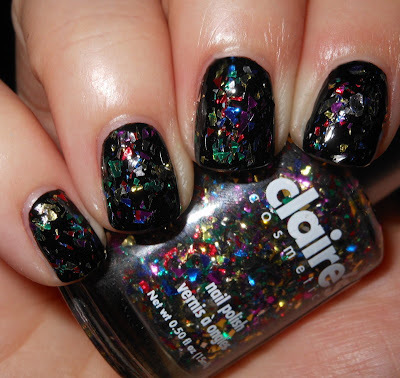 I have been staying away from Claire's and Icing because I love their glitters! They are so fun! Pinata is so fun! I never go into Claire's because the one here is super small and overly crowded and disorganized. I've never been into an Icing before - I should probably try it out! This is a great polish. I love the comparison with the Cult Nails polish, I think I need BOTH! Pinata is a cool polish! And very pretty too. I have about three shredded polishes from Icing. I just love that store. I have a hard time not buying at least one polish when I go there. This is so pretty! I haven't tried claires nail polishes yet but might have too soon! Great comparison! Thanks for sharing! Oooh, normally I'm not one for shard/shredded glitters but I really like Pinata! I might have to go searching for it.